<h2>Black Sea research could reveal cultural sites and methane ice - Dr Adrian Stanica</h2><br /><p><strong>The Black Sea is a unique inland sea with coastlines in six countries. What does this mean for its management?</strong></p> <p>'First of all, it’s a bridge between two continents, Europe and Asia. The sea was in a very bad ecological state 25-30 years before now and in the end, we managed to improve the situation, and the fact that we have a healthier sea now is ... the result of collaborative research. All the bad impacts, however, were felt throughout the entire system. If we (the countries surrounding the Black Sea – Romania, Bulgaria, Georgia, Russia, Turkey, Ukraine) don’t work together, then we cannot address the problems in a holistic way. 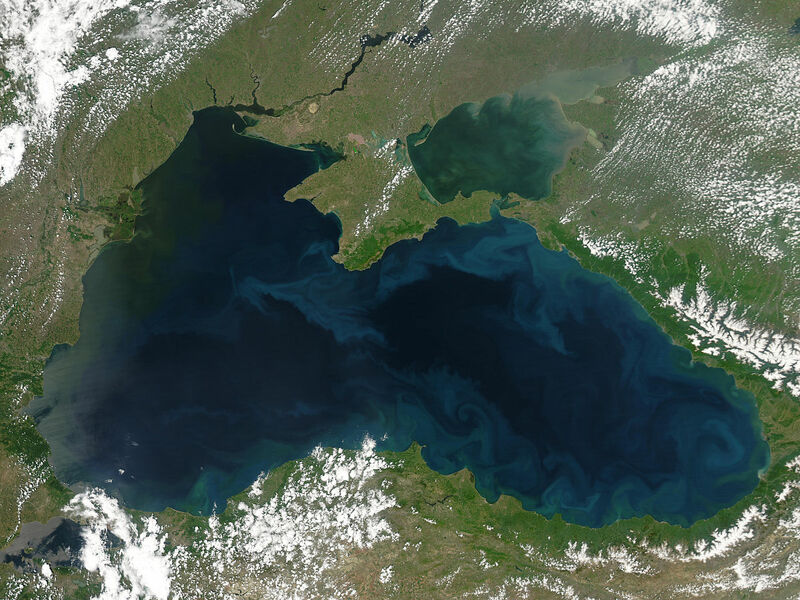 To understand how the Black Sea works and how to make it healthier, we need to have collaborative research. '</p> <p><strong>The Black Sea is interesting because major rivers such as the Danube and the Dnieper drain into it, but over 90% of the water is anoxic, meaning there is no oxygen to support life. In your view, where are the main research gaps? </strong></p> <p>'There is a huge amount of work to be done to understand both the interactions between the rivers and the Black Sea, as well as the functioning of the Black Sea itself in much better detail. We are not talking about classical marine sciences, but also about new developments, such as molecular biology that will make us understand the communities of microbes living in that area lacking oxygen, naturally occurring in most of the Black Sea. You need chemistry, you need biology, geology, hydrology, oceanography, you need practically everything to understand what’s going on there. &nbsp;</p> <p>'Still related to the Black Sea, but from a different point of view, I think it’s extremely crucial to bring back to life our common cultural heritage, for example. '</p> <p><img class="@alignleft@" title="Dr-Adrian-Stanica-Portrait " src="https://horizon-magazine.eu/sites/default/files/summer%20school%202010_0.jpg" alt="Re-establishing a common cultural heritage in the Black Sea region is an important step to move forward with a research and innovation plan there, says Dr. Adrian Stanica. Image credit - Dr. Adrian Stanica" width="1870" height="1297" /></p> <p><strong>Your group is developing a strategic research and innovation plan for the region. How will this contribute to economic growth in the Black Sea region? </strong></p> <p>'We’ll be able to interact in a much more proficient way with the decision-makers involved in several fields of interest, like coastal tourism, marine resources, aquaculture and navigation. We have lots of ancient sites, sunken ships and so on, which can be made available to the public for coastal tourism. The Black Sea was a key part of the ancient world - if you travel around it, you’ll see the remnants of the ancient Greek, Roman, Byzantine, and Ottoman civilisations as well as more recent architectural heritage, resulting from the intermixing of Central European, Russian – Tsarist Empire, but also British and French influences.</p> <p>'The fact that we have been part of the Communist regime during the Cold War really built a wall that needs to be taken down, and this common cultural heritage has to be re-stitched together because it has been completely wiped away from the memory of people. We don’t know everything that we have because there have been very few marine archaeology projects, but what we have is already a lot to make quite attractive tours.</p> <p>'The unique environment can be a key to unknown resources. (There is) methane ice under the water at depths of several hundred metres, and that frozen methane can be a source of energy for tomorrow. That’s just one of the many potential opportunities. '</p> <p> <div class="quote-view quotesBlock quote_horizontal"> <div class="quotesTop"><img src="https://horizon-magazine.eu/sites/all/themes/horizon/images/quotes_top.png" alt="" title="" /></div> <p>'To understand how the Black Sea works and how to make it healthier, we need to have collaborative research. '</p> <blockquote><p>Dr Adrian Stanica, GeoEcoMar, RO</p></blockquote> <div class="quotesBottom"><img src="https://horizon-magazine.eu/sites/all/themes/horizon/images/quotes_bottom.png" alt="" title="" /></div> </div> </p> <p><strong>You’re the coordinator of the DANUBIUS</strong><strong>&nbsp;project – can you&nbsp;tell us&nbsp;</strong><strong>a bit about that?</strong></p> <p>'DANUBIUS is not just about the Danube and the Black Sea. It will be a research infrastructure that will try to develop excellent science so that managers of river-sea systems can put in practice efficient integrated management plans. The issue at the moment is that freshwater and marine specialists are not working together, they sit back-to-back instead of cooperating. The biggest problem is at the contact point between the rivers and the seas - deltas, estuaries - where we don’t even know very well all the processes occurring there. And these are among the most critical areas in the world because deltas and estuaries are where you find the greatest natural wealth. '</p> <p><strong>What would be the best case scenario for the Black Sea? </strong></p> <p>'I believe in the huge role of science diplomacy, that we need to talk to each other - EU and non-EU countries alike. I think we’ll find that by working together on this agenda and transforming it into reality we’ll be able to build many bridges. I think that we’ll be able to develop plans that we’ll successfully implement to have a healthier sea, more productive sea. I really hope we will succeed but this is because I am an optimistic fool! '</p> <p><em>If you liked this article, please consider sharing it on social media.</em></p> <p> <div class="moreInfoBlock"> <h3>Black Sea research agenda</h3> <p>The European Commission is publishing a vision paper setting out priorities for Black Sea research at the <a href="https://ec.europa.eu/maritimeaffairs/maritimeday/en" target="_blank" rel="noopener noreferrer">European Maritime Day</a> in Burgas, Bulgaria, on 31 May.</p> <p>These include increasing ecosystem resilience and mitigating the effects of climate change, supporting marine and maritime innovation, and helping the emergence of new economic sectors, particularly in the fields of energy, marine food and biotechnology.</p> <p>The vision paper is the result of work carried out by national and EU-funded projects, and is a step towards developing a full stragetic research and innovation agenda (SRIA) for the Black Sea region. The final SRIA will be launched in Romania in 2019.</p> </div> </p> <p><a href="http://bit.ly/newsalertsignup" target="_blank" rel="noopener noreferrer"><img src="https://horizon-magazine.eu/sites/default/files/news-alert-final.jpg" alt="" width="983" height="222" /></a></p> <br /> <img src=”http://www.google-analytics.com/collect?v=1&tid=UA-40077089-1&cid=black-sea-research-could-reveal-cultural-sites-and-methane-ice---dr-adrian-stanica&t=event&ec=republish&ea=read&el=black-sea-research-could-reveal-cultural-sites-and-methane-ice---dr-adrian-stanica&cs=republish&cm=republish&cn=republish&cm1=1" /> This post <a href="https://horizon-magazine.eu/article/black-sea-research-could-reveal-cultural-sites-and-methane-ice-dr-adrian-stanica.html">Black Sea research could reveal cultural sites and methane ice - Dr Adrian Stanica</a> was originally published on <a href="https://horizon-magazine.eu/">Horizon: the EU Research &amp; Innovation magazine | European Commission</a>. Cooperative marine research projects between the countries surrounding the Black Sea could reveal cultural heritage sites and unknown resources such as frozen methane, as well as enhance economic growth, bolster tourism and strengthen political bonds, according to Dr Adrian Stanica. He is Director-General of the Romanian National Institute of Marine Geology and Geoecology (GeoEcoMar) and one of the experts tasked with identifying the research gaps and opportunities in the Black Sea region. The Black Sea is a unique inland sea with coastlines in six countries. What does this mean for its management? The Black Sea is interesting because major rivers such as the Danube and the Dnieper drain into it, but over 90% of the water is anoxic, meaning there is no oxygen to support life. In your view, where are the main research gaps? 'There is a huge amount of work to be done to understand both the interactions between the rivers and the Black Sea, as well as the functioning of the Black Sea itself in much better detail. We are not talking about classical marine sciences, but also about new developments, such as molecular biology that will make us understand the communities of microbes living in that area lacking oxygen, naturally occurring in most of the Black Sea. You need chemistry, you need biology, geology, hydrology, oceanography, you need practically everything to understand what’s going on there. Your group is developing a strategic research and innovation plan for the region. How will this contribute to economic growth in the Black Sea region? 'We’ll be able to interact in a much more proficient way with the decision-makers involved in several fields of interest, like coastal tourism, marine resources, aquaculture and navigation. We have lots of ancient sites, sunken ships and so on, which can be made available to the public for coastal tourism. The Black Sea was a key part of the ancient world - if you travel around it, you’ll see the remnants of the ancient Greek, Roman, Byzantine, and Ottoman civilisations as well as more recent architectural heritage, resulting from the intermixing of Central European, Russian – Tsarist Empire, but also British and French influences. 'The fact that we have been part of the Communist regime during the Cold War really built a wall that needs to be taken down, and this common cultural heritage has to be re-stitched together because it has been completely wiped away from the memory of people. We don’t know everything that we have because there have been very few marine archaeology projects, but what we have is already a lot to make quite attractive tours. You’re the coordinator of the DANUBIUS project – can you tell us a bit about that? What would be the best case scenario for the Black Sea? The European Commission is publishing a vision paper setting out priorities for Black Sea research at the European Maritime Day in Burgas, Bulgaria, on 31 May. These include increasing ecosystem resilience and mitigating the effects of climate change, supporting marine and maritime innovation, and helping the emergence of new economic sectors, particularly in the fields of energy, marine food and biotechnology. The vision paper is the result of work carried out by national and EU-funded projects, and is a step towards developing a full stragetic research and innovation agenda (SRIA) for the Black Sea region. The final SRIA will be launched in Romania in 2019.